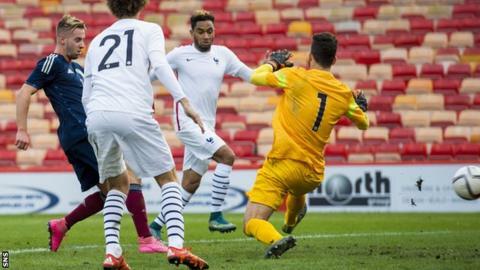 Scotland suffered their first defeat in European Under-21 Championship Qualifying Group 3 as an impressive French team claimed their first win. Ricky Sbragia's side handed their feted visitors the lead when Stephen Kingsley clearance struck team-mate Stuart Findlay and rolled into the net. After the break, Corentin Tolisso burst into the area and smashed a drive past Jack Hamilton for France's second. The hosts had Ryan Gauld sent off before Billy King's late consolation. The French join Scotland on three points from two games, with Iceland top on 10 points after four games. Scotland were on the front foot from kick-off with Hibernian striker Jason Cummings feeding Hearts' Sam Nicholson, who could not get his shot away quickly enough as Athletic Bilbao centre-back Aymeric Laporte moved in. France then suffered an early set-back when Tiemoue Bakayoko hobbled off to be replaced by Monaco team-mate Thomas Lemar. Bayern Munich first-teamer Kingsley Coman also left the fray during the first half. The substitute made an immediate impression with a low centre between goalkeeper and defence, which Kingsley attempted to clear but only succeeded in hitting off Findlay and the ball trickled home. Scotland needed inspiration and Gauld almost delivered with a left-foot curler which crashed off the crossbar. The French were always a threat, though. Lemar scuffed a shot wide, Paris St-Germain starlet Adrien Rabiot almost converted after a rapid break from the back and only a last-gasp challenge from Inverness' Ryan Christie prevented Utrecht striker Sebastien Haller from an easy tap-in. Scotland, though, struggled to get their own influential performers on the ball with any regularity as France enjoyed possession. Hearts defender Jordan McGhee did almost touch home from close range after some Gauld trickery earned a free-kick but the ball was directed straight into Mouez Hassen's arms. The visitors appeared to step up their performance in the second half and were rewarded with a brilliant individual goal from Tolisso, who surged into the box, beat a couple of challenges and fired a superb angled strike home. That unsettled the Scots, with Lemar almost adding a third moments later before Gauld was red carded for taking out Guingamp's Marcus Coco from the back as France broke forward in numbers. King did stab home a stoppage-time goal from close range but the outcome was never really in doubt. Sbragia's side now face a vital home match against an Iceland on Tuesday. Scotland Under-21: Hamilton, Paterson, Kingsley, Findlay, McGhee, McGinn, Christie, Nicholson (King 68),Slater (Shankland 58), Gauld, Cummings (McManus 78). Subs Not Used: R Fulton, J Fulton, Love, Hyam. France Under-21: Hassen, Mendy, Laporte, Amavi, Pavard, Rabiot, Bakayoko (Lemar 8), Tolisso, Walter, Coman (Coco 23), Haller (Crivelli 90). Subs Not Used: Maignan, Guilbert, Lenglet, Jean.